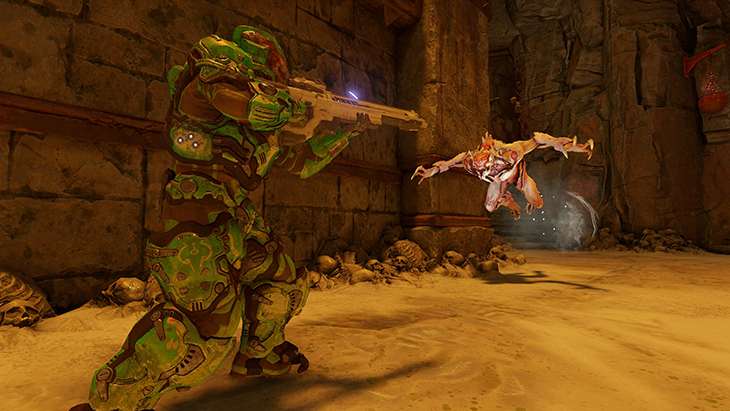 Bethesda has released a new update for Doom that adds a number of additional features including the much-anticipated Arcade Mode. As the name suggests, Arcade Mode in Free Update 4 transforms the game’s single-player campaign into a competitive, fast-paced time attack in which you aim to get the highest score possible. You’ll have access to all weapons, Runes and equipment upgrades at the start of each run. It’ll be your job to come up with the optimal equipment combination to get through each stage as fast as possible while grabbing multipliers along the way and absorbing as little damage as possible. It’s a clever way to recycle the game’s campaign that makes it feel fresh. The update also brings classic Doom modules to SnapMap, Doom’s level creation tool. To help jump-start things, id Software built a handful of classic maps for players to try out. Along those same lines, it’s also now easier to recommend and review maps you’ve played. It doesn’t end there as the update introduces two new multiplayer maps as well. In Possession, a team of marines are matched up against several player-controlled Prowler demons. Each marine that is killed respawns as a Prowler, putting additional pressure on the remaining marines. Bloodrush, meanwhile, tasks players with maintaining their Bloodrush meter used to respawn by getting kills and assists. The meter drops significantly when you are killed and depletes over time until there’s just one player remaining. Full details on the update can be found over on Bethesda's website. Updated and tried it last night and had a blast. I applaud this upgrade mode. More developers should offer up free content like this. Billybobjoey, Brock Kane and MoeJoe like this. I never bought this game but with everything they have added along the way I don't think I should wait much longer. It's an awesome game, stop waiting! Puiu and MoeJoe like this. Lionvibez and Puiu like this. Yes, but don't you mean $30. LOL when they say something is 29.99 or "Hey, it's under 30 dollars!" Let's stop pricing things like this please! We, the people are not that stupid any more, or are we? Well, showing my age here a bit but none of the upgrades will ever be as good as the original. Oh sure, the graphics and SF are superior, but when Doom arrived it was in answer to Castle Wolfenstein and was the first you could set up and play collectively on a closed network, It was truly earth shattering, in fact back in my days at Westinghouse the IT department shut down the network support between 11:30 and 12:20 every day so all the IT folks could play Doom across the network for an hour ............. Oh to be young again! Phr3d, Panda218 and Peter Farkas like this. Brock Kane and EClyde like this. Wow, sell the game for $60 (too much for a game,MHO) and then add free content to it so that it stays new-ish and fun for longer than the x-days it takes to complete a game? multi AND solo? Make the buyer Happier? We can hope the success and accolades regarding this decision filter down through the NOT EA brands, wasn't Doom pretty bugless too? Nicely done, Bethesda, please Promote the individual(s) responsible for this decision (AND adequate Testing). @Al, I was small-business -- the number of Win 3.11 systems/upgrades that I installed -so the owner(s) and employees could Doombinge- was a staggering-high percentage of my business that year, lol. Arguably the First "GottaHaveIt" software craze.